Converting facilities for exporting DOC files to various document formats became available for use on a web-server. Now you can integrate a converter into any web application or run it in multi-user mode locally. Total Doc ConverterX is specially developed for VB.net based systems, supports Active X technology and provides converting functionality that can be integrated into any web interface. Total Doc ConveterX works similarly with single originals and batches. One or a few originals can be processed in one command. You can process as many files as you have spending a few seconds on specifying required parameters. 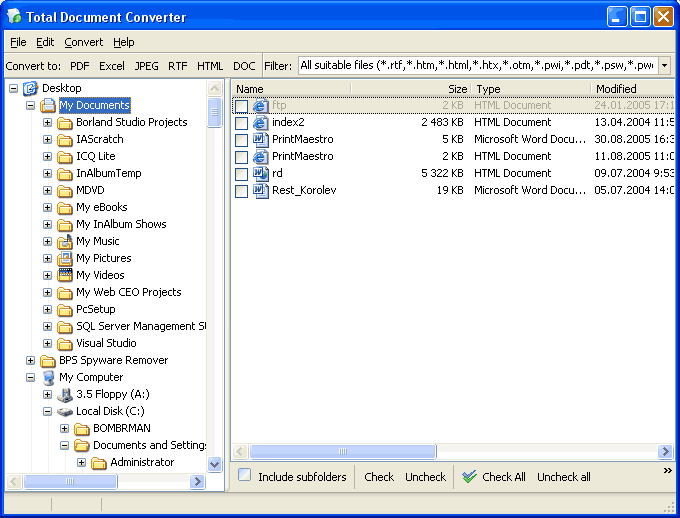 Such productivity makes this DOC converter one of the most efficient solutions for heavy use. Whatever target format is selected, a user is able to adjust all format parameters. If it is graphics, choosing compression mode, paper format and colour scheme is provided. When it is text document format, paper and font properties can be adjusted. In such a way you will get files, converted in a way you specifically need. The conversion process itself is very fast. If Total Doc ConverterX is run on a web server, conversions are managed via command line. You will need only to specify required parameters, the source and destination address and the target format. When it is handled via some web application, conversion options can be integrated into its interface. Total Doc ConverterX is available in licensed and free trial versions. Get the one right now!